Jeff Warren (Glenn Ford) returns from fighting in Korea to take up his old job at a railway yard, moving back in with his friend Alec (Edgar Buchanan). When Carl Buckley (Broderick Crawford), the crotchety assistant yard supervisor, is sacked he begs his young beautiful wife (Grahame) to use her influence with Mr Owens (Grandon Rhodes). Despite getting his job back his anger, alcoholism and jealousy get the better of him. Jeff falls for her, finding himself increasingly under her spell; but she’s a dangerous woman. (Extremely loosely) based on a novel by Emile Zola (La Bete humaine), but owing far more to Jean Renoir’s adaptation, Human Desire is a compelling noir and dangerous melodrama. Fritz Lang takes his subjects and spins them around, keeping the viewer one-step behind. Grahame is electrifying on screen, almost impossible to resist. Along with a fine cast and an intelligent script, Human Desire is an immersive descent into desperation and deceit. 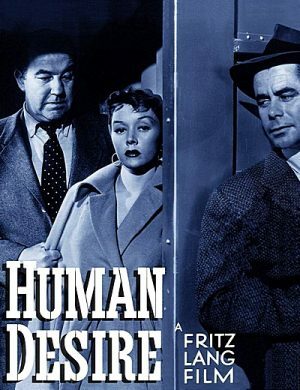 • Interview with Tony Rayns - in this new video interview, critic and filmmaker Tony Rayns discusses the production history of Human Desire, Emile Zola's novel and Jean Renoir's film, the key similarities and differences between the characters that Glenn Ford and Jean Gabin play, some of Fritz Lang's stylistic choices, etc. The interview was conducted exclusively for Eureka Entertainment. In English, not subtitled. (30 min). • Trailer - a vintage trailer for Human Desire. In English, not subtitled. (2 min).